Shana Wride in “2.5 Minute Ride” at Diversionary Theatre. Lisa Kron won two Tony Awards in her first foray on Broadway: Best Book of a Musical and (with composer Jeannine Tesori) Best Score. The show, “Fun Home,” was named Best Musical of 2015, and it was a finalist for the Pulitzer Prize. . But long before that, Kron was known as a founding member of a satirical, feminist theater troupe, The Five Lesbian Brothers. 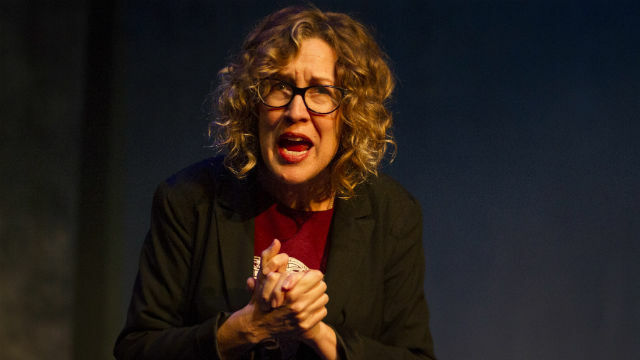 And as a playwright/performer, she was highly regarded for her two autobiographical works: “2.5 Minute Ride,” which premiered at the La Jolla Playhouse in 1996, before moving to acclaim Off Broadway. And “Well,” which debuted on Broadway in 2006. Since one play is about her father, and the other about her mother, it’s astonishing that no one until now had the idea to put them together. Thanks to the creative thinking of executive artistic director Matt Morrow, Diversionary Theatre is currently presenting both plays, in alternating repertory as The Kron Rep. The brilliant pairing caps a season of plays by women (with one exception), Morrow’s staunch and commendable response to the still appallingly paltry percentage of female playwrights produced nationwide. These two pieces not only share thematic elements. Kron is exploring her relationship to her parents, and in trying to understand them, she learns a bit more about herself. But even more interesting, in both pieces, she’s experimenting with dramatic structure and form. She breaks the fourth wall, acknowledging the presence of the audience – talking directly to and even interacting with us. Beyond that, in both cases, the story sort of gets away from her, and takes on a life of its own, heading in directions the playwright wasn’t intending. So, we’re watching the product and the process at once. It’s exhilarating. “2.5 Minute Ride” takes its name from a long harrowing roller coaster at Cedar Point Amusement Park in Sandusky, OH, to which Kron and her family (her mother’s side, all “cripples” of one sort or another, hobbled by illness) take an annual trip. Her father, at the time of her writing, is in his mid-70s, suffering from diabetes, heart disease and being both legally blind and hard of hearing. None of that has dimmed his enthusiasm for roller coasters. It’s not like there was a dearth of excitement in his earlier life; born Jewish in Germany, he was part of the Kindertransport, a rescue effort that sent him to safety with a foster family in Connecticut. His parents died at Auschwitz; his entire family was lost in the Holocaust. In further connection to her roots, Kron relates her trip to Auschwitz with her father (a lifelong dream for both), and her brother’s Orthodox Jewish wedding in Canarsie, Brooklyn. These three interwoven, time-hopping stories paint one part of a picture of this eccentric family. “2.5” becomes most potent when “Lisa” actually becomes her father, and recounts his post-war experience in Germany as an interrogator of Nazis. How he, a young man, faces another equally young man, and realizes how easily their roles could have been reversed. It’s a chilling moment. Under the sharp, astute direction of Rosina Reynolds, Shana Wride gives a magnificent performance. An accomplished actor and director about town, she’s making her first attempt at solo work — and the result is superlative. She’s captivating, riveting, drawing us in, then pulling back, providing a case study in subtle shading. The performance covers a wide range of emotions and tones — from loving to resentful, angry to tearful, joyful and funny to incredulous and uncomprehending. Wride makes us believe, at every moment, that this is her own story, a deeply emotional, gut-wrenching journey. 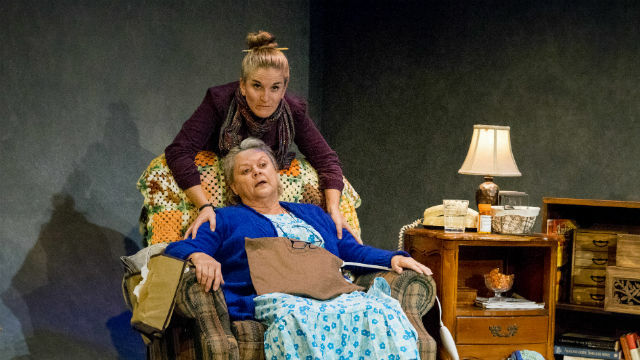 Samantha Ginn and Annie Hinton in “Well” at Diversionary Theatre. “Well” is a different kind of beast to wrestle with. Though it’s equally emotional and autobiographical, it contains other characters as well as “Lisa”: her social activist mother, confined to her La-Z-Boy recliner, eternally sick (with “allergies, though Lisa admits that today, she’d probably be diagnosed with Chronic Fatigue Syndrome or Fibromyalgia); and a bevy of others in Lisa’s life, from neighbors to childhood friends to a school bully, to the caregivers and roommates she encountered when she herself became ill, had to leave college, and checked into a Chicago Allergy Unit for extensive tests, “cleansing” and treatment. The whole play-within-a-play effort collapses under its own weight. “Lisa’s” mother insists on talking to the audience, too, and complains about the oversimplifications and omissions in her daughter’s story. The other four actors become so disenchanted with their roles, and with “Lisa’s” negative descriptions of her mother, whom they’ve fallen for, that they actually walk out on her. “Lisa” is left alone onstage, contemplating what the play was really about. She has consistently insisted that it was not about her relationship with her mother (though of course it is). To her, it’s an exploration of illness and healing, and the tale of a community coming together in mutual support. (Lisa’s mother formed and headed a Neighborhood Association that forced early integration and busing in Lansing, MI, uniting the community through social activities. She could, says “Lisa,” heal a neighborhood, but not herself). Once again, “Lisa” has to confront her resentment and get to the nub of her feelings — in this case, her terror that she may wind up just like her mother, sickly and incapacitated. Kym Pappas does an excellent job directing an excellent ensemble. At the center are Samantha Ginn as Lisa, a tour de force portrayal of self-assurance undermined by self-doubt and outside questioning. This show is less funny than “2.5,” but Ginn mines all the humor she can. As her mother, Annie Hinton is magnificent — understated and unbowed. A marvelous performance. All the other characters (some 16, including each of the actors portraying themselves) are deftly and flexibly created by Adam Cuppy, Cashae Monya, Durwood Murray and Tiffany Tang. In a casting coup, the two blonde, dimpled “Lisas” and their also-dimpled Mother actually look like family. The design elements for both productions are minimalist but highly effective (scenic design by Sean Fanning, lighting by Curtis Mueller, sound by Melanie Chen, costumes by Kate Bishop). These two plays, viewed in tandem, present not just a portrait of a family, a warm-hearted picture of parents. But the works reveal a skillful young playwright developing and honing her craft, experimenting with form and style, laying herself bare, fearless in attacking difficult themes. Her lesbianism is present in both plays, but not central to either, though in “2.5,” Peg, her partner at the time, was an ever-present source of support as “Lisa” and her friend try to shoot a documentary about “Lisa’s” father. Right now, the national tour of “Fun Home, The Musical” is at the Ahmanson Theatre in Los Angeles (through April 1). For anyone inspired by these two terrific productions at Diversionary, or anyone interested in the craft of theater and the evolution of a gifted playwright, the musical is bound to provide an exciting counterpart to the two early works of Lisa Kron. But right here in San Diego, if you’re an avid, open-minded theatergoer or theater-lover, you owe it to yourself to see both these fascinating plays. You will inevitably find something in your own history or family to relate to, and that will only enrich this theatrically provocative experience. Performances are Wednesday-Thursday at 7 p.m., Friday-Saturday at 8 p.m., Sunday at 7 p.m., with matinees Saturday and Sunday at 2 p.m.